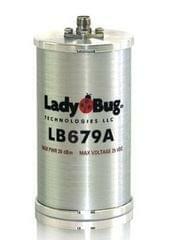 The LB480A is a pulse profiling sensor providing the user a time domain plot of the signals pulse modulation. The sensor also measures average power and statistical peak & pulse power along with duty cycle and crest factor. The sensor is useful in radar comms, R&D and manufacturing as well as service. The sensor features exceptionally fast measurement speed, a broad dynamic range and is shipped with LadyBug's feature rich Power Meter Application and Pulse Profiling Application. Recommended for average power measurement, peak and pulse measurements within the sensors 10 MHz video bandwidth.The LB480A is an easy to use, high-performance, pulse-profiling, pulse (modulation), and average power meter and sensor in one. When ordered with option 004, it features a 10 MHz video bandwidth for pulse profiling applications. It measures a -60 dBm signal compared to others that only measure down to -35 dBm, and provides superior in-class performance with high speed measurements and temperature compensated accuracy. Traditional user zero and user reference calibration have been eliminated. Get up and running quickly with the Pulse Profiling power panel. Use the supplied drivers and programming examples for ATE applications. Easily integrate the power sensor(s) into Lab View, C, VB and other environments. Integration and usability are further simplified because calibration and zeroing are not required before use and, you have the flexibility of selecting from a variety of connector types including SMA, N, and 3.5 mm. 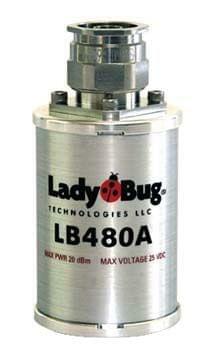 Contact LadyBug Technologies for TNC connectors. Option 004 provides selectable video bandwidth filters up to 10 MHz for pulse profiling applications. Option 001 provides a <3 Hz bandwidth 0 to 1V analog recorder output signal. Option 0W2 provides a wideband, calibrated analog, negative detector video output signal ~ 1 to 0 Volts (requires option 004).